Pre-school performances to Senior Chamber Choir to 101K streams on her first song composition, meet Glisha Dela Cruz. 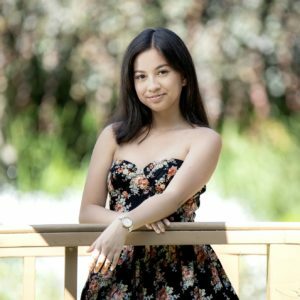 Born in Winnipeg raised in our temperate west coast rainforest in the heart of Surrey, Glisha was interested in music from a very young age of 2 or 3 likely because her parents loved to sing to her. Self taught, Glisha plays the guitar and ukulele and finds musical inspirations from artists such as Ariana Grande, Sabrina Claudio, and Tori Kelly. Glisha fell in love with public singing at the mere age of 4 while performing for an audience of 2,000 people. “I remember my first performance was at age 4 during the talent portion of a modelling competition in Banff. 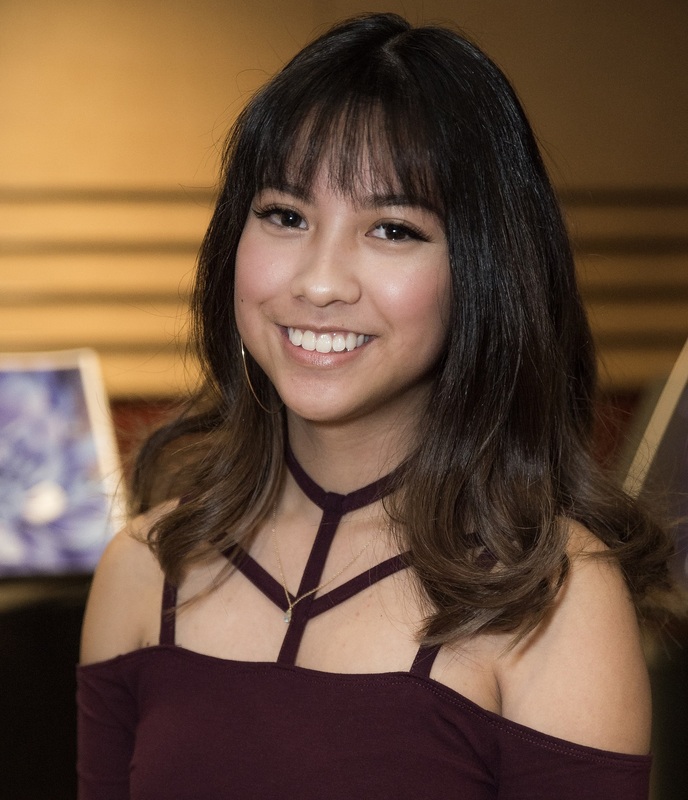 I sang my favourite Disney song: The Little Mermaid’s Part of Your World.” From this age onwards, Glisha’s parents supported her love for music and enrolled her in voice lessons to help her grasp many performing opportunities. They continue being her biggest support group. “ My mentors and biggest supporters are most definitely my parents. I’ve had various vocal instructors and plenty of friends to support me, but my parents are the ones who are willing to be completely raw and honest with me in terms of not only my success in music but also my failures, or parts that I need to improve and work on. They push me to be better.” And, we do love those honest parents. 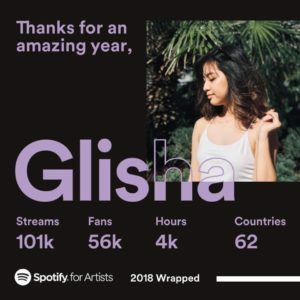 Glisha now 18 years old, went from performing covers, doing guest performances, and paying homage to her favourite songs, has started to write her own music. She has successfully released her first song composition “Over Myself” that received over 101,000 streams with 56,000 fans in 62 countries on Spotify as an independent artist. You can also listen to her first composition, “Over Myself” on various other music platforms such as Apple Music, iTunes, and Youtube. Now that Glisha is starting to further strengthen her writing skills, she tells us that she looks for “Human interaction and the play of emotions as concepts which spark ideas for her writing. I am a very personal writer, but I also like to put myself in other people’s shoes, and write about topics that pull a certain emotion out of a listener—whether I have felt that emotion” Glisha is pairing her passion for writing by studying Communications at SFU and supplementing her music and writing skills by working part-time as a jewelry store key holder. What high school did you go to? Most memorable high school/postsecondary moment? Johnston Heights Secondary School (Surrey). Being a part of the Senior Chamber Choir was my most memorable high school memory. The whole experience of bonding with a team who shared the same growing passions that I did musically, is something I think I’ll carry with me forever. Do you also love to dance/act/draw? I’ve always been a creative person whether it came to music, visual arts, or acting. Throughout high school I took art classes, drama classes, and choir. I believe different forms of art are most beautiful when they come together. Being creative yet versatile is a quality I value dearly. Currently, music has been my main focus. What is your favorite hobby or hobbies? Aside from writing and listening to music, going out with my friends and trying new foods are my favorite hobbies. I think the only other thing I am so fond of as much as music is a good meal! Your favorite food? I love Mexican food; Tacos, burritos, churros (especially! ), you name it.